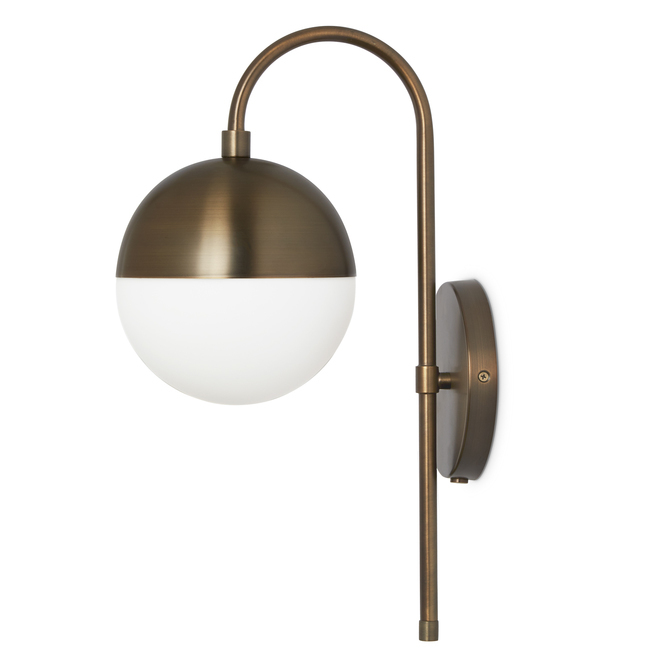 There are only 9 available of the Powell LED Wall Sconce with Hooded White Globe, Bronze. Your selected quantity has been adjusted. Updated to accommodate an energy-efficient, luminous G9 LED bulb (included). 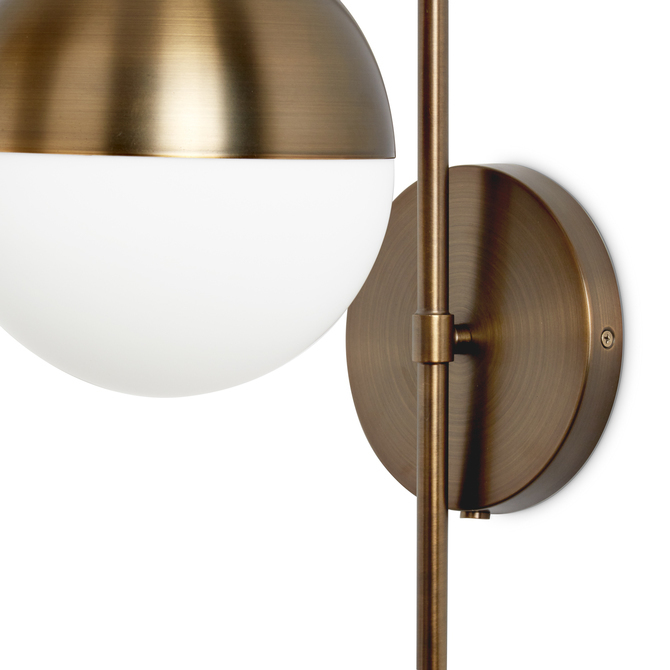 The Powell Wall Sconce is a contemporary spin on a mid-century modern classic. 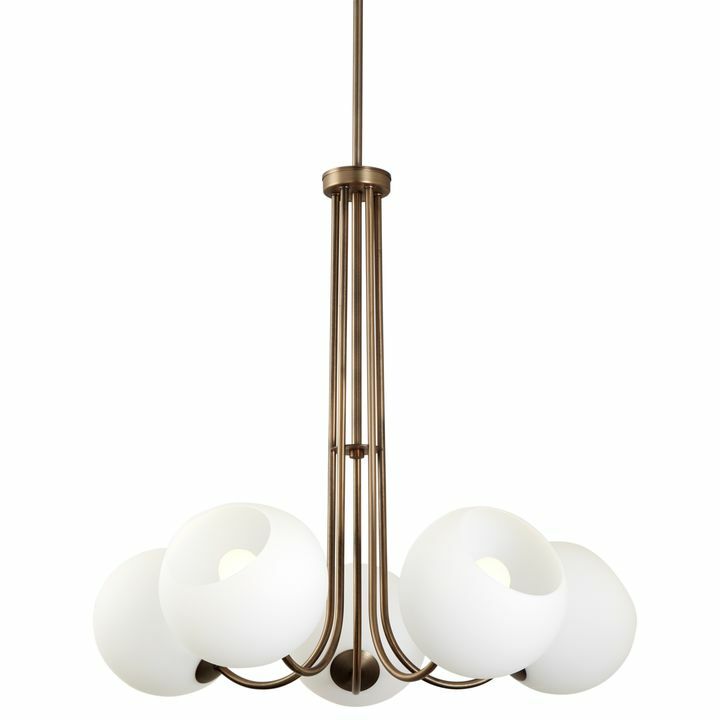 Features a frosted, glass globe capped with a spun metal hood that is suspended by an elegant, gooseneck arm - all in a timeless bronze finish. Ideal in pairs; add ambient, yet direct light by flanking a couch, a fireplace, a favorite painting or a mirror. 7" W x 16" H x 10.5 Ext. 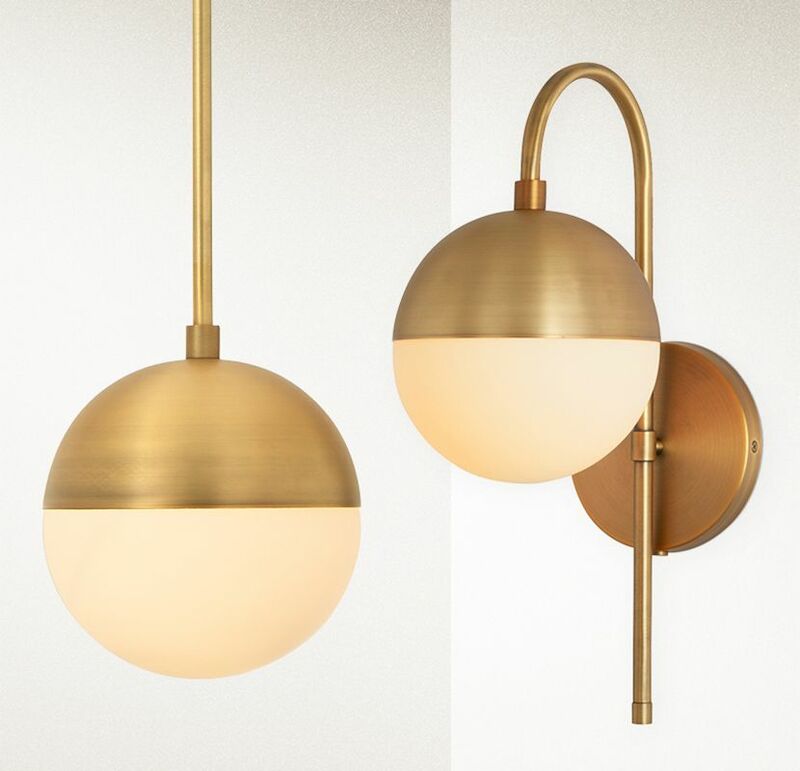 The aged brass wall sconces were a preorder, and haven’t shipped yet, but I had a question for Lights.com that was answered quickly and gave me the information I needed. I will update this and attach a photo when my lights are received and installed. 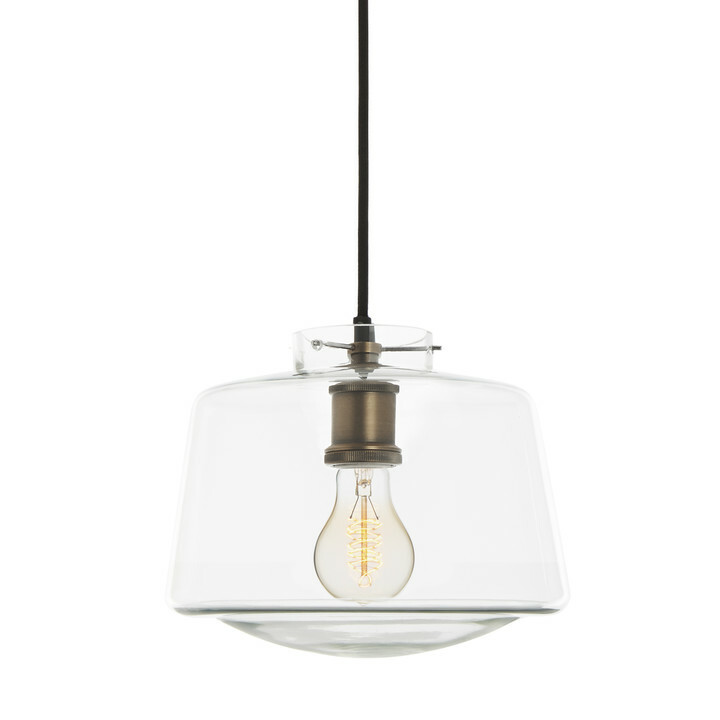 Great fixture, looks high end. Easy to install. 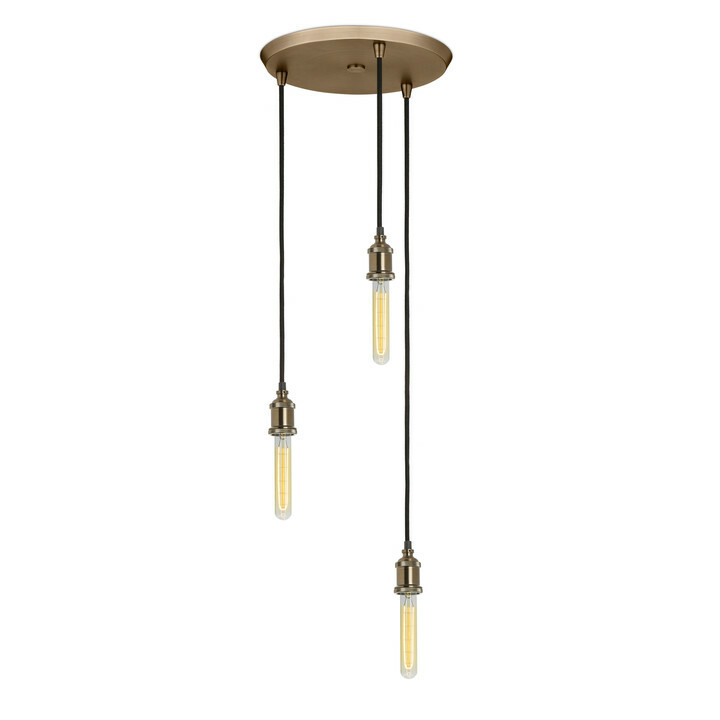 I'm actually using this fixture as my outdoor covered front porch light. It's a great mid-century touch that helped transform the front of the house. Easy to install. Strange rectangular light bulb, though. I like these are a bigger size so they make a statement and don't get lost in the bathroom. We put this in an office bathroom as part of a dramatic little makeover and it's really beautiful. I put the wire in so it will plug in, and the dimmer works great. The scale of the piece is nice and it's subtle enough to work well with the decorative mirror but also is interesting enough on its own. I recommend. 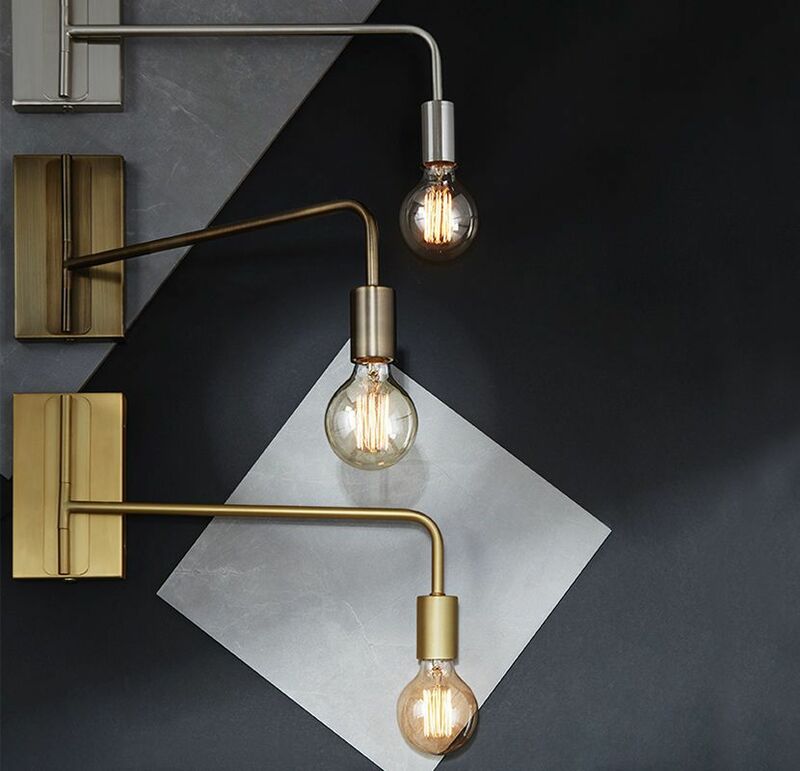 Love these unique sconces - perfect for a space that is stately but eclectic and needs stylish flair. Very nice lamp. Difficult for me to install, but IвЂ™m very inexperienced with this kind of work. We bought these lights to go in a basement theater room. 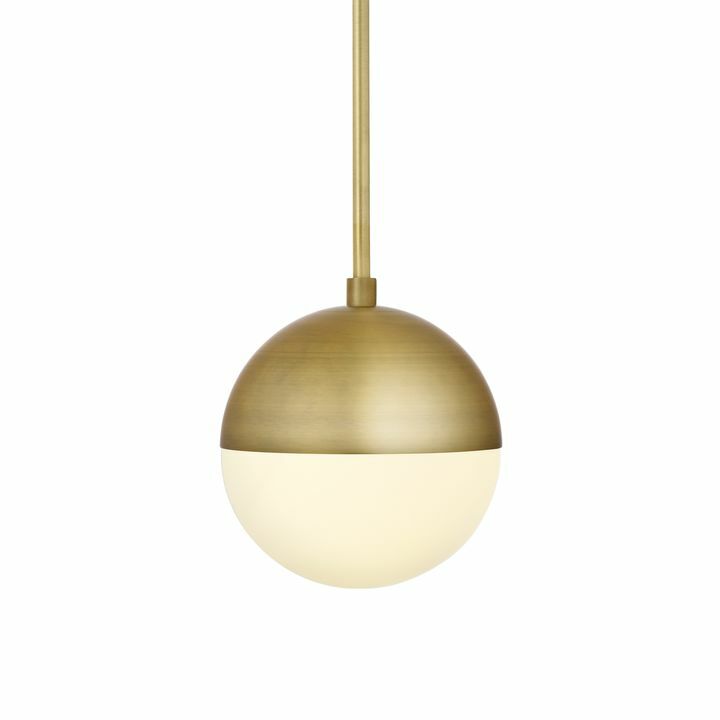 The brass finish is the perfect color and the overall effect is modern, classy and polished. We purchased two and mounted on the wall (corded, not hardwired) and had a bit of trouble lining up the holes in the gold cover plate with holes on the wall mount. Doesn't seem like they were machined very precisely. However, we managed to get them up and they look great. I have concerns about replacing the lightbulb when it burns out. I've never seen a bulb like this, and didn't expect it to be so unusual, but maybe I didn't read the description closely enough. I very much like the aesthetic of this fixture, and the dimmer feature. I went with the plug-in option, and found it easy enough to complete the wiring despite being inexperienced. One of the fixtures didnвЂ™t work but customer service was very quick to process the return and reship. I wish the time of the light was slightly warmer, but IвЂ™m just going to buy a gel to wrap around the LED bulb within the glass globe. IвЂ™ve already received a few compliments on the look of the sconce, so IвЂ™m happy despite these few minor points! Quality crafted product just as described. Easy install. Great customer service. Would order again! I bought two of these, one for each side of our bed. My wife and I really like them. They came as pictured and the brushed metal looks quality made. I used the plug in option so they were very easy to mount, assemble and install, 6 or 7 minutes each. Product arrived in good condition. Installation was easy, instructions where partially clear. Overall look is very good. Would buy again. These lights were an amazing quality for the price. Look like RH level of workmanship. Beautiful light fixture. Great quality! It looks great in my master suite. 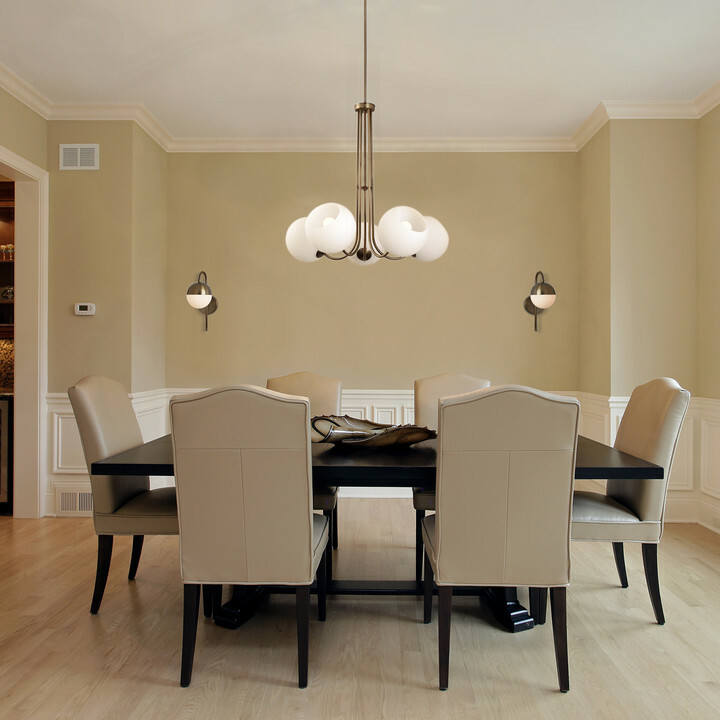 These were exactly the lamps I was looking for, they look beautiful in my dining room and the dimmers work perfectly. I am very pleased with the look of the pair of lights. The lights are perfect for the application. My husband and I love these stylish lamps. 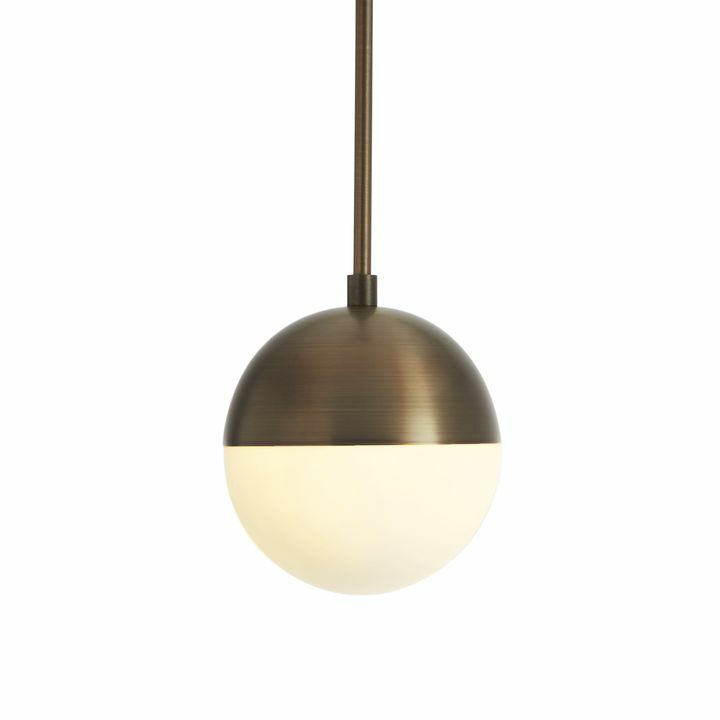 The dimmers are the best feature and the globe softens the brightest setting. We love this new wall sconce, the color is great and accurately pictured. We couldnвЂ™t be happier with this for a little extra вЂњpopвЂќ in our new kitchen. Awesome lights and easy to install. Look great. Great lamps. They look beautiful! Service was amazing. Thank you! These are perfect! I purchased two of these sconces for going up our stairs. They not only look great, but they let off good light. The brush brass is consistent with the photos. Great quality for an affordable price! They are fantastic! Just like the description and photos, the finish is brushed brass and looks consistent with photos. The dimmer option is great. I converted them to a plug-in option and it wasn't difficult. Highly recommend! 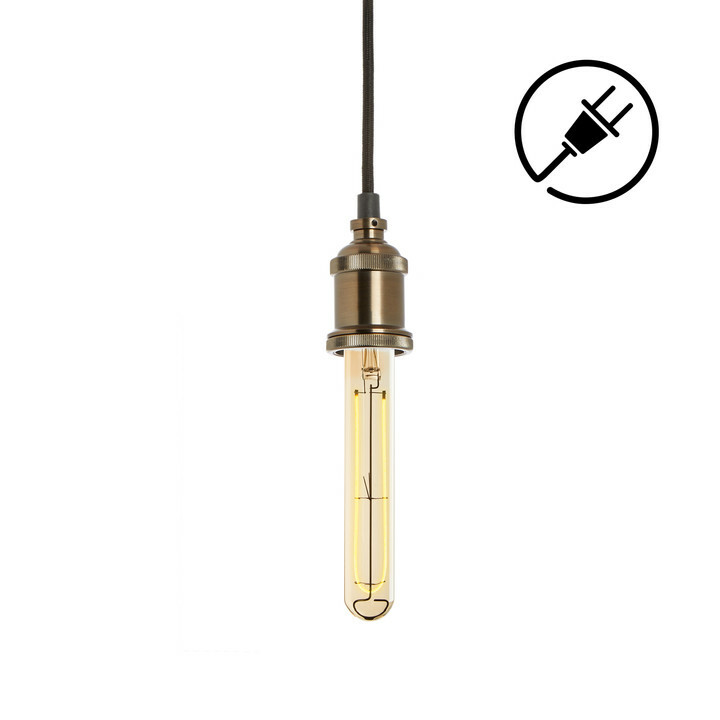 Great looking, affordable light! Materials and fittings are also of great quality. The lights look great and seem quality made. I misjudged our space and they are too big. But I love them. I am really thrilled with the workmanship of this light--it looks and feels high quality, and came with very clear mounting instructions. (It's been challenging to make it fully flush with our wall, but our wall is very old plaster and tricky to mount on so that's par for the course). The dimmer switch provides excellent control of the full range of light. 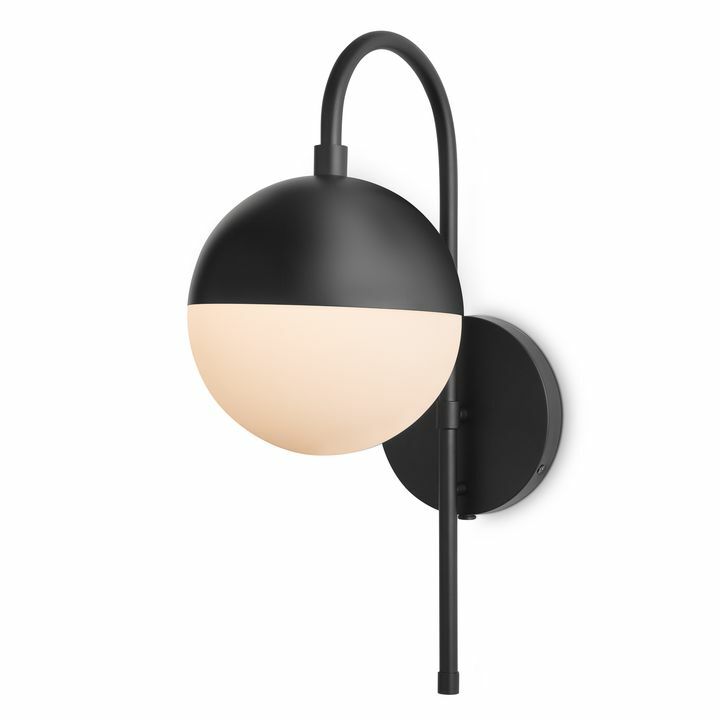 This is almost perfect for what I needed--a wall-mountable, not-hard wired reading light for a dark spot by the couch, with a slightly MCM feel to match the rest of our living room. The ONLY drawback is the cord. I assume that most people looking at a mounted (vs. clamp-on) plug-in sconce are, like me, using it as an alternative to a traditional wired light to avoid sometimes expensive and messy electric work to rewire a room. I was prepared for a cord--obviously--but the dimmer switch, which is quite large, cannot be moved up or down on the cord. This makes a big lump on the cord about a foot down from the light. I cannot cover this with a cord cover, or in any way make it inconspicuous. It's kind of an eyesore--though we're getting used to it, as you do--that does detract from a really gorgeously designed piece. The customer support team has said they would look into possible cover solutions for me when I struck out finding anything on my own. I have an electrically-savvy relative who might be able to rewire the switch lower down on the cord so that I could stick the dimmer switch behind the arm of the couch and paint or use a standard cover on the rest of the cord to make it blend in, but clearly that's a pretty extreme solution. Anyway, I still highly recommend this light, just be prepared for the cord situation. A photo of that on the website would have been helpful. Could an on/off switch be added to this light when it is used as a plug in? I want to mount them on both sides of a bed, but the only plug is behind the bed. Thanks. When using the plug-in application, you'll turn the light on by a dimmer switch near the top of the cord, so you may not need to make any modification to the fixture and still easily plug it in behind your bed. An electrician can add an on/off switch to the light, but we would recommend caution and to get a good electrician to do it. Making that modification will void the warranty. 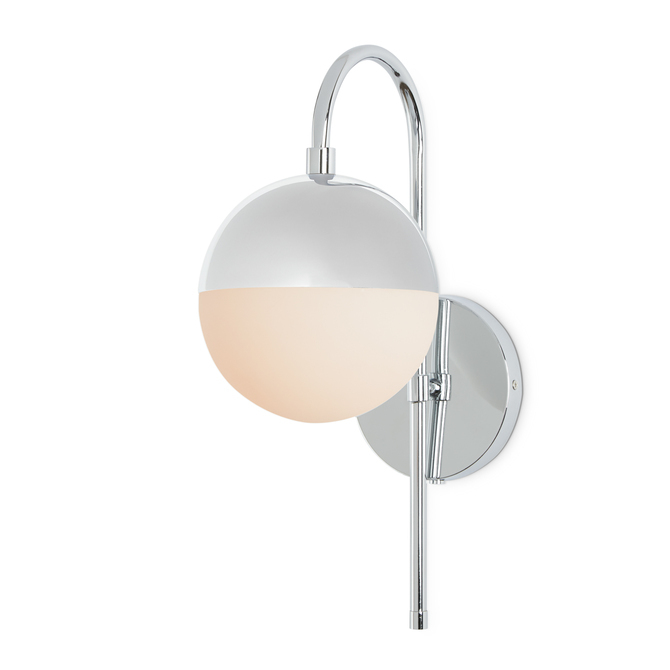 I'm looking for a plug in sconce for a very small bedroom - does this fixture provide sufficient light for reading in bed? Also, can standard LED bulbs be used and can the equivalent of a 60Watt bulb be used? Thanks. 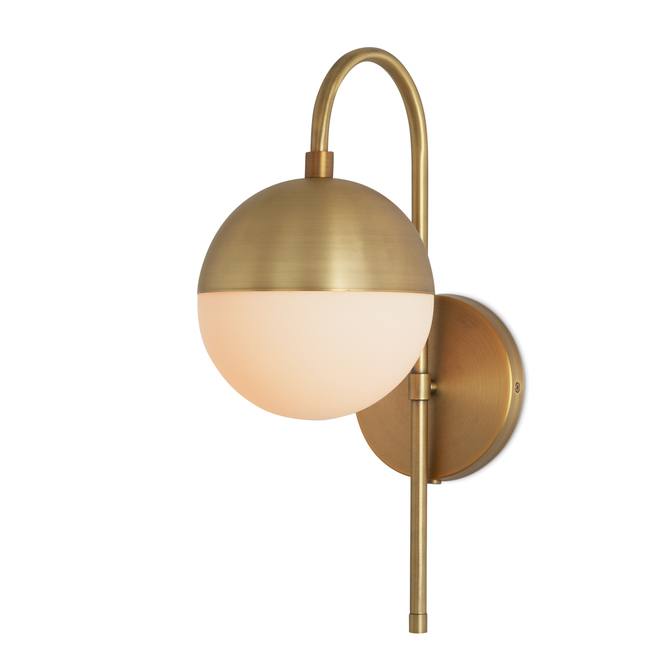 The Powell LED Wall Sconce with Hooded White Globe, Aged Brass can provide enough light in a small bedroom, depending on how small the bedroom can be. 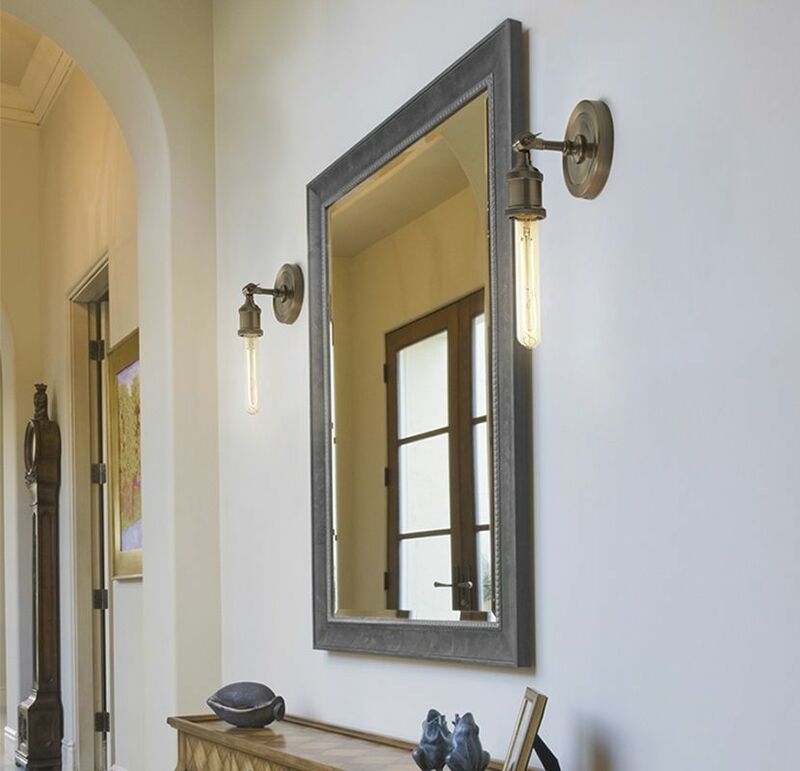 Two sconces would be the best option to provide sufficient light. 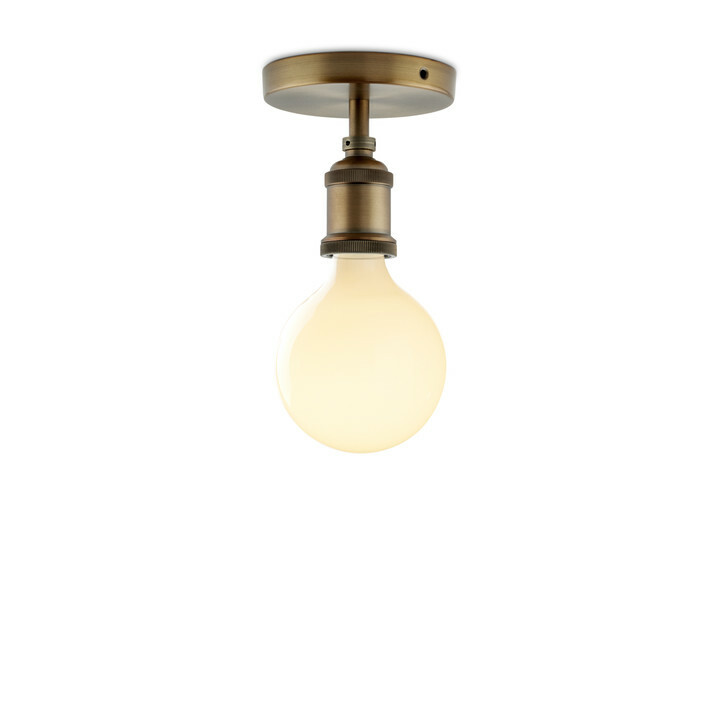 This sconce can use a standard G9 bulb. 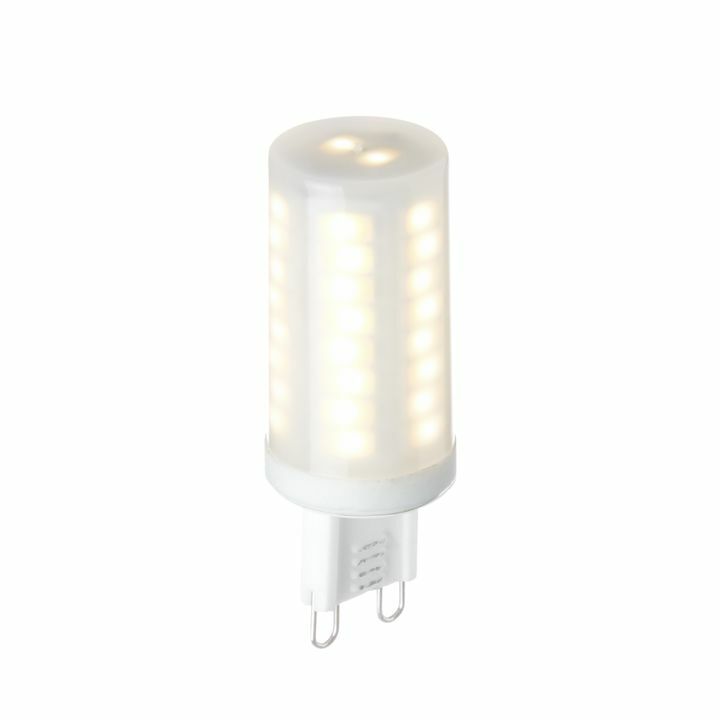 LED would be great, as long as the bulb does not surpass 40W, 120V. If you like to purchase other bulbs that are equivalent to a 60w bulb, try looking at higher lumen count bulbs and or higher KV bulbs. Can you tell me its availability and when I would receive this light? I love this piece and would love it for my covered front porch. It would not get direct rain. Would it work? Will this sconce take a regular incandescent bulb with a screw base? How far does this lamp extend from the wall? Is there any way to select a different cord color for the plug-in option? I would think most people wouldn't want a black cord against white walls. We do not recommend installing the sconce outside as to they are not damp located. When hardwired into the wall, is there an on/off switch on the fixture or is a light switch on the wall required to operate? There is not on/off switch on the fixture. The fixture must be hardwired into a junction box where there should be a light switch already connected into the wall. Hello! 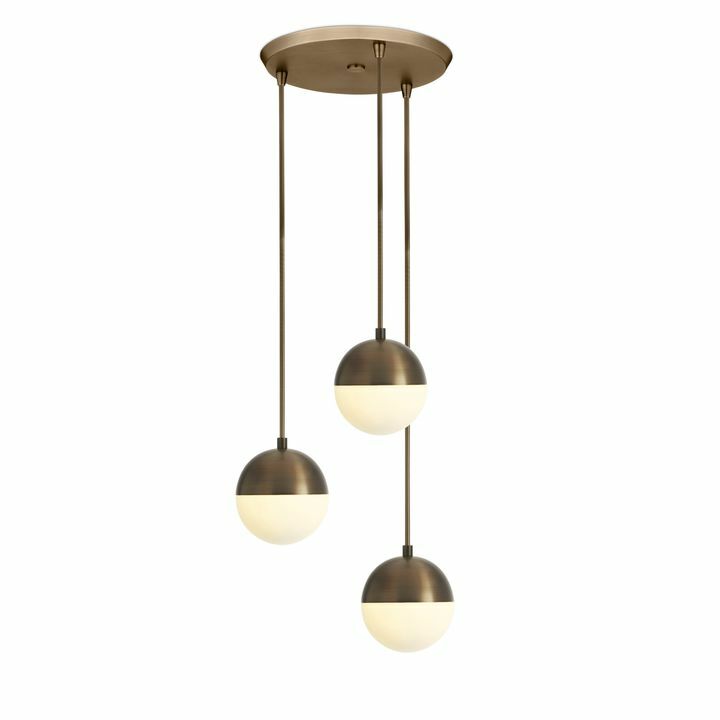 We are considering this light to install in multiple bathrooms. Is it rated for damp spaces, such as a bathroom? Thank you! Unfortunately, the Powell Wall Sconce is not recommended to be installed in bathrooms. How do I order this with the plug in option? 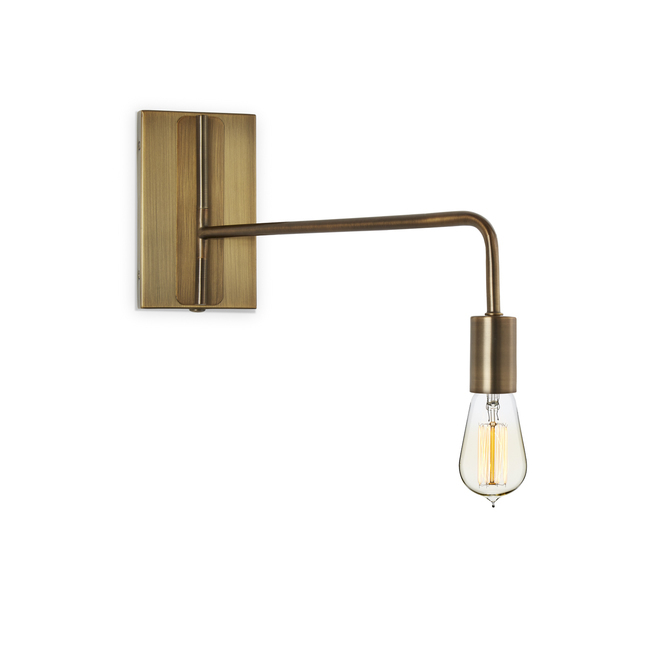 The Powell Wall sconce comes with both hard wired and plug in option. Does this light have a switch to turn on/off if used without cord? 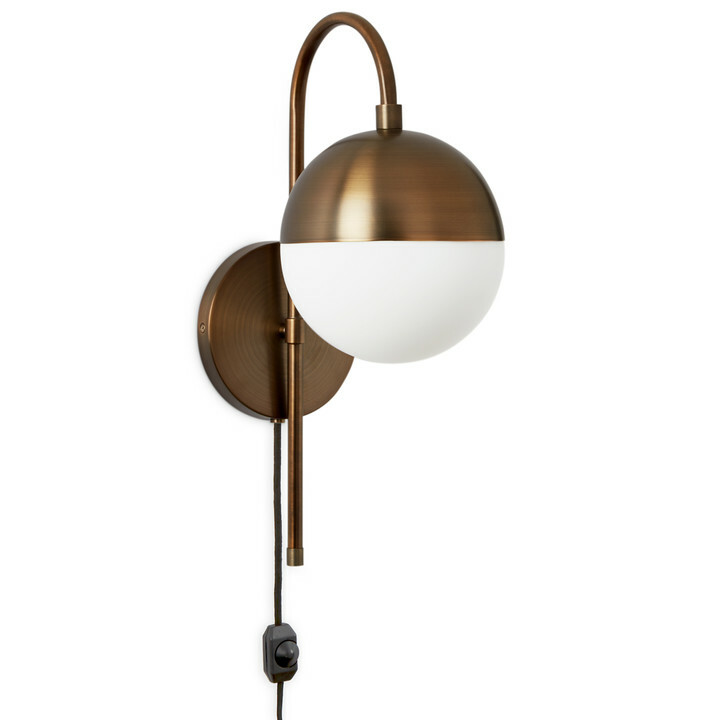 The Powell Wall Sconce is either hard wired or plug in. The plug in only includes the dimmer. There is no actual on/off switch on the fixture.